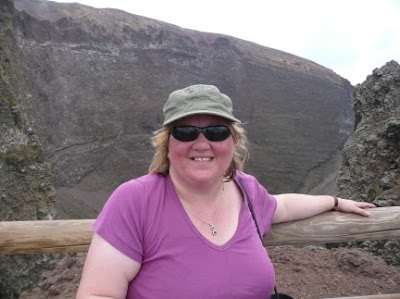 On Tuesday, we took the train from St Agnello to Pompeii, where we were serenaded by a busker playing the saxophone really loudly (Chris grinned his head off when I surreptitiously switched sound off) - then caught a bus to Vesuvius itself. 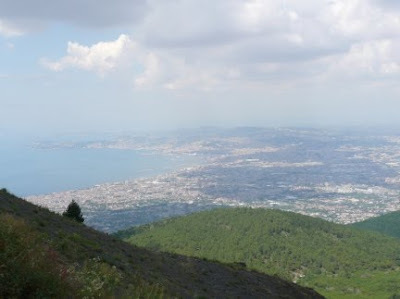 The road was very steep, with hairpin bends and lots of gorse and amazing views over the Bay of Naples. Vesuvius is the only active volcano on mainland Europe (Etna and Stromboli are on islands); its last eruption was in 1944, but the most famous eruption was on 24 August AD 79 (more of which later). Plus, as you’re walking on little piece of lava, it’s quite slippery; so we needed the stout sticks we were offered. 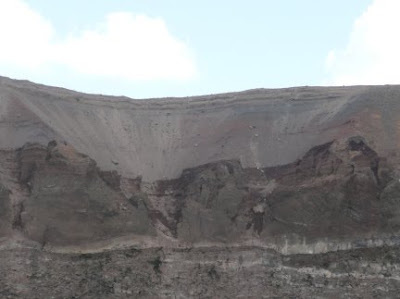 To the right in this pic, you can see the scree on the side of the volcano. 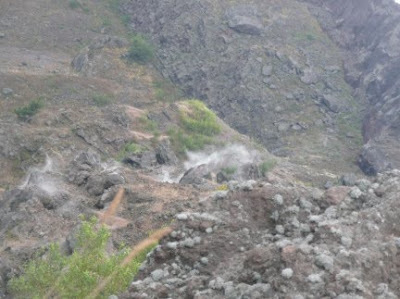 It's dust and pumice and lava - some of it's pink, some of it's grey, and some of it is silvery and glittery. 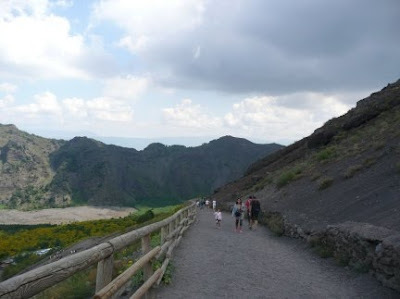 At the top (1267 m), the view of the crater was stunning. You could smell the sulphur (as well as seeing the bright yellow deposits on the top of the crater) and we were thrilled to see the smoke coming out of the vents. The views over the Bay of Naples were pretty stunning, too. You could follow the line of the last eruption by the green of the vineyards. We bought some lava souvenirs, and the children were thrilled to be given some haematite by the boys who handed out the stout sticks. 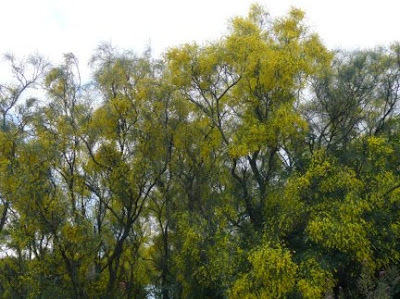 We caught the open-top bus back; you could smell the sweet scent of gorse (which is so huge that it becomes a tree here, rather than a bush). And in the town there were lots of gorgeous blue flowers. 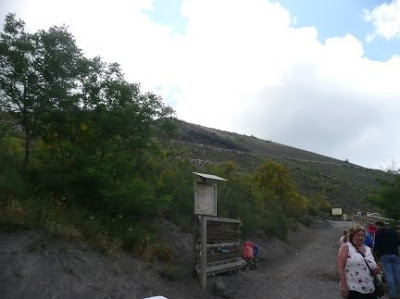 We were too lazy to go up Vesuvius, we're leaving that for next time! 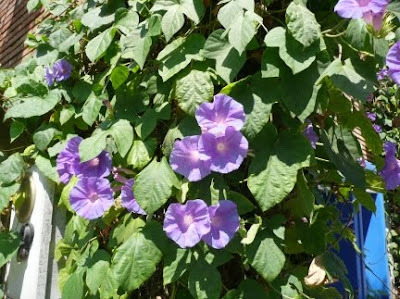 The blue flowers are Ipomea, or morning glory. I love those and sometimes grow them here. 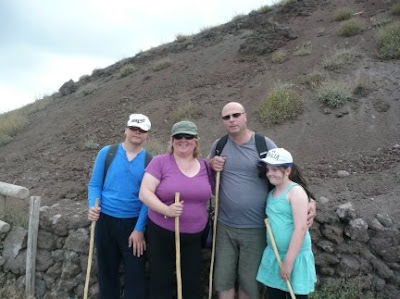 Well done for climbing up all that scree, rather you than me! Great pictures as usual Kate, and Caroline your story sounds fab! Isn't it wonderful? Your pictures brought it all back. What fabulous pictures - now I'm even more jealous than I was before, which is saying something. Lovely pictures for a lovely place which I know so well! Did you also visit "Villa dei misteri"? I'm loving these pics, Kate. Cara - thanks so much for telling me what the flowers were! They're gorgeous. And Vesuvius is definitely worth the haul. Michelle - it was stunning. And I'm talking about Pompeii for the rest of the week, so that will bring stuff back for you as well. Michaela - somehow, we managed to miss the Villa dei Misteri (and missed all the lovely frescoes, sigh) - but we had been walking round all day and were really hot and tired by that point!